The President's Challenge has been a program that encouraged all Americans to make being an active part of their everyday lives. For many years, you could earn awards for your physical fitness activities, including patches, medals, and certificates. The program was produced by the President's Council on Physical Fitness and Sports, with a mission to promote the benefits of fitness everywhere it can. The PALA+ program encourages you to reach the physical fitness and nutrition goals set by the 2015-2020 Dietary Guidelines for Americans. As of 2018, the program is an eight-week program and you will need to use their paper logs to chart your progress. While logging was hosted on the FDA Supertracker site, that site is being discontinued as of June 30, 2018. Age 6 to 17: 300 minutes per week. Age 18 and over: 150 minutes per week. In the first five weeks you log your physical activity and the food you eat. You try to reach as many of the healthy habit goals as you can. By the sixth week you must reach the physical activity goal. You have the seventh and eighth weeks to make the goal if you can't achieve it in the sixth week. To earn the award, you must achieve at least six of these nine goals and at least one of them must be a dietary limit goal. Once you achieve your goal and earn the reward you can print out your award certificate: PALA+ Certificate - PDF. 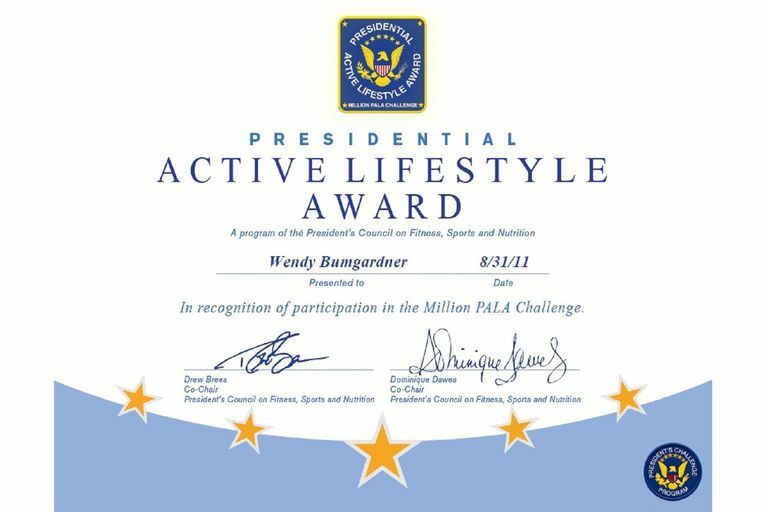 If you prefer, you can purchase a full-color award certificate online from the National Fitness Foundation's PALA+ online store. You can also purchase a T-shirt or patch. Earning a Bronze award takes 40,000 points, Silver requires 90,000 points, Gold requires 160,000 points, and Platinum requires 1,000,000 points. You could select walking and pedometer as two of the activities and track time or steps. Walking 30 minutes or 5000 steps equals about 110 points. You could choose from over 100 different activities. Awards will be available while supplies last from the Presidential Champions Awards Store through July 31, 2018. Visit the National Foundation for Fitness, Sports, and Nutrition and purchase a patch, medal, shirt, mug, or another item from their online store. The Presidential Youth Fitness Award moved to its own site in 2016. Physical educators assess the students in their classes with the FitnessGram categories. They order recognition items for the students who qualify for the award. FitnessGram software is available to help score the assessments.